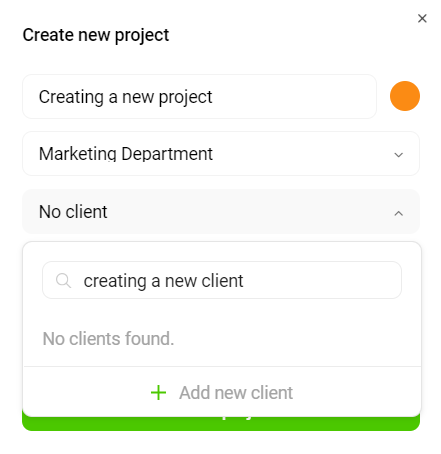 Assigning Clients to your projects will allow you to get an extra level of time tracking data categorization and make it easier to create reports by applying both the Project and the Client filter. If you work on different projects (or provide multiple services) for a single client adding the same client to multiple projects will allow you to keep better track of the entire scope of work you are doing for that client. An overlay will pop-up, start typing the new Client name using the "+Select client" field and hit "Enter"
An overlay will pop-up, in the "No client" field type in the name of your new Client and click on "+ Add new client"
After clicking the "x" sign next to the Client you'd like to delete you will be asked to confirm your decision. Once you confirm that you'd like to delete a Client there will be no way to undo the action and the client will be removed from all Projects it was allocated to. To edit clients you should follow the steps above detailing how to delete a client, only this time instead of the "X" sign you should click on the "pen" sign to edit a Client name. After being edited, the update Client name will be applied to the client and the new name will be shown for the client with all previously allocated time entries.